Tiger Woods tees off during the final round of the Hero World Challenge on Sunday. 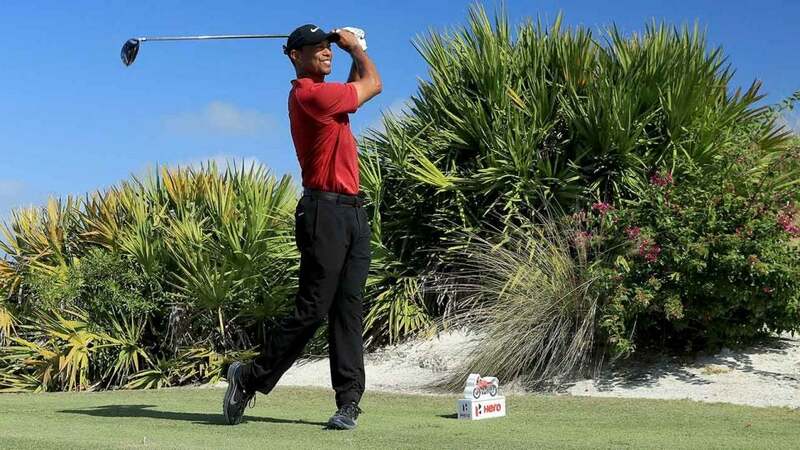 It was a tale of two nines for Tiger Woods in his final round of the Hero World Challenge on Sunday in the Bahamas. Woods, the tournament host, was in last place to begin the final round of the 18-player invitational but struggled early, making the turn in 40 after a no-birdie, four-bogey front side. He rebounded on the back side to birdie four of the first six and signed for a one-over 73. "The round wasn't very good starting out. It was quite awful," Woods said. "Somehow turned it around and got rolling a little bit, got to even par for the day somehow. Made a mistake there on 17, but overall it was a long week." Woods finished one under and in 17th place, one shot ahead of his Sunday playing partner Hideki Matsuyama, who shot 75 on Sunday. Woods shot rounds of 73, 69 and 72 the first three days. Woods's front nine started with a missed fairway and missed green that led to a bogey on the 1st, and it didn't get much better. He hit only two fairways and three greens on the front side. But Woods drained a long birdie putt on 11 that got him trending in the right direction. After a par on 12 he rattled off three straight birdies, the latter after his eagle putt lipped out. His only blemish on the back was a short missed par putt on 17 for a bogey 4. "I just always compete," Woods said. "It was not very pretty on that front nine. I kept making mistake after mistake." Expectations were much different for Woods at this year's Hero. Last year he made his return from a fourth back surgery at this event and finished eight under for the week and tied for ninth. Jon Rahm shot 65 to win at Albany.